Natural wood construction with a robust metal wire frame and angled head for convenient usage. 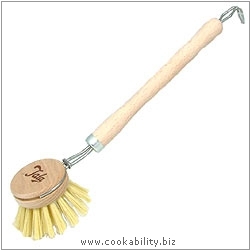 Synthetic fibre bristles for cleaning stubborn and stuck-on foods. Hanging hook allows for easy storage. Ideal for cleaning dishes, glasses, pots and pans, etc.